CITES Appendix II. An area of 1,450 km2 on Gunung Kelapatmada in the west of the island is proposed as a reserve. It remains to be confirmed whether this site meets the conservation needs of all Buru's threatened landbirds. The Wildlife Conservation Society continues to operate wildlife crime market/trade surveillance and enforcement. This includes the trade hubs of both east and west Indonesia, and the work is set for considerable expansion in the coming years. They are also exploring the potential for habitat protection-based projects on Buru (N. Brickle in litt. 2007). A visit to Buru in May and June 2010 raised awareness of the species and its conservation amongst local people, and a return visit is intended (A. Gray in litt. 2010). Conduct widespread surveys ranging out from the Lake Rana area (and potentially also Teluk Bara area), to establish its current status, distribution, habitat requirements and movements. 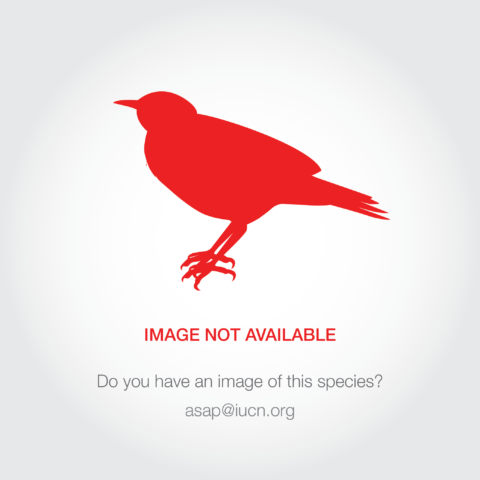 If key sites for the species are identified, propose their establishment as strict protected areas. Support the establishment of a proposed reserve at Gunung Kelapatmada. Charmosyna toxopei is endemic to the island of Buru, South Maluku, Indonesia, where it was known from seven specimens collected in the 1920s, on the west side of Lake Rana. It was recorded by only one of the 24 collectors active on Buru, implying that it is either very rare, localised, nomadic or has specific habitat preferences. In November 2014 at least two Blue-fronted Lorikeets were observed and photographed on Buru (Robson 2014). Prior to 2014, recent targeted searches yielded no confirmed records of the species (M. Poulsen in litt. 2012), though there have been plenty of unconfirmed and older reports. Observations of an apparent Charmosyna lorikeet on the island, possibly this species, suggest it may be present around Teluk Bara. 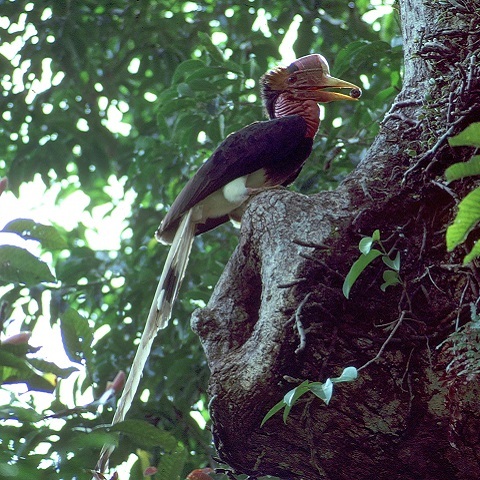 The species was recorded between 1979 and 1981, with an unconfirmed report in 1989, and interviews with local villagers during the 1990s and 2010 possibly refer to this species; though the interviews in the 1990s revealed that only local people living west of the Rana River knew it, and a survey in May and June 2010 failed to produce any sightings. It should also be noted that local people frequently refer to all green parrots as "karenga" and make no differentiation between species (A. Gray in litt. 2010). A record of birds being trapped in 1998 and three Charmosyna spp. seen in 2006 (M. Halaouate in litt. 2007) probably also refer to this species. 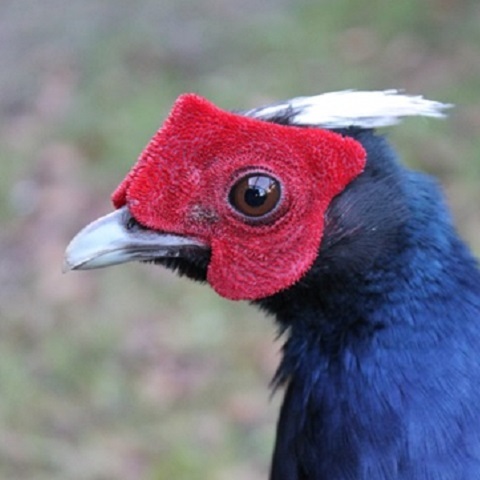 The lack of confirmed records makes it problematic to assess this species's population size, but unconfirmed reports have described it as "quite common", although only from one part of a very small range. 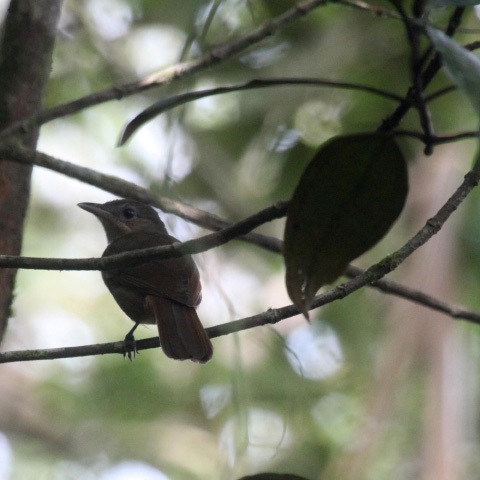 Owing to the considerable loss of lowland forest and the paucity of confirmed records this species is suspected to have an extremely small population, probably numbering 50-249 mature individuals. This equates to 75-374 individuals in total, rounded here to 70-400 individuals. The island's extensive montane forests remain largely undisturbed and the topography of the Kaplamandan mountain range means that almost all of the montane forest is expected to be inaccessible to loggers (A. Gray in litt. 2010). However, having a montane distribution that is close to the maximum altitude within its range, this species is potentially susceptible to climate change (BirdLife International unpubl. data). Additionally, while montane forest appears to be relatively undisturbed, most forest in the coastal lowland of Buru has now been cleared, and much of the forest in the northern part of the island has been selectively logged or degraded and fragmented by shifting agriculture, such that only a few small patches of primary lowland forest remain. In 2010, there was at least one fairly large-scale logging operation on Buru, situated in the lowlands (though gardens on the island still contain many indigenous tree species). All the original specimens were caught alive using lime, however the species is not kept as a pet, nor apparently is it traded.